A treat anytime, these oysters get added flavour from the sauce made with delicious ingredients including the mayonnaise dressing. Mix dressing, cheese, lemon zest, juice, chives, capers, garlic, Worcestershire sauce and hot sauce until blended. Combine bread crumbs, butter and pepper in separate bowl. Heat broiler. Sprinkle salt onto rimmed baking sheet. Shuck oysters, leaving oysters and juice in bottom shells. Top oysters with dressing mixture, then crumb mixture. Place on prepared baking sheet. Broil, 6 inches from heat, 2 to 3 min. or until oysters are done and crumb mixture is golden brown. 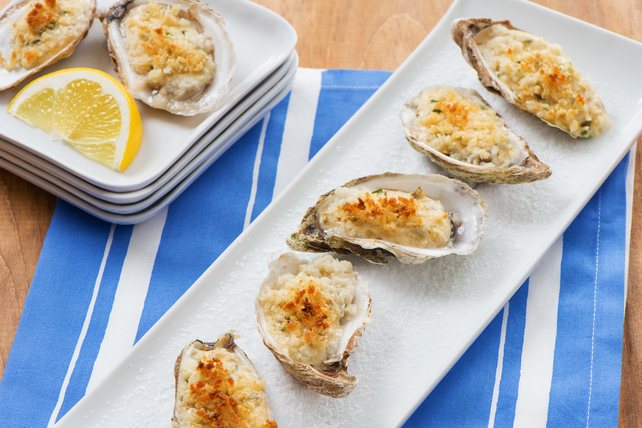 Place oysters on serving dish sprinkled with some salt from baking sheet. Serve with lemon wedges. Garnish with 1 Tbsp. chopped fresh parsley before serving. Sprinkling the salt onto the baking sheet and serving dish helps prevent the oysters from tipping over as they are broiled or served.